Love Birds by Amy Clipston While Ellie Lapp (from The Forgotten Recipe) and her mother are still mourning the loss of her brother, Seth, Ellie starts working at one of the gift shops in town. Seth’s friend Lloyd is talented at carving wooden birds, but his father disapproves and expects him to take over the family farm someday. Ellie sees the beauty in Lloyd’s creations and insists Lloyd sell the birds in the gift shop where she works. As Ellie and Lloyd spend more time together, they begin to develop feelings for one another, but she accidentally betrays his trust. Will she lose any hope of a future with him? 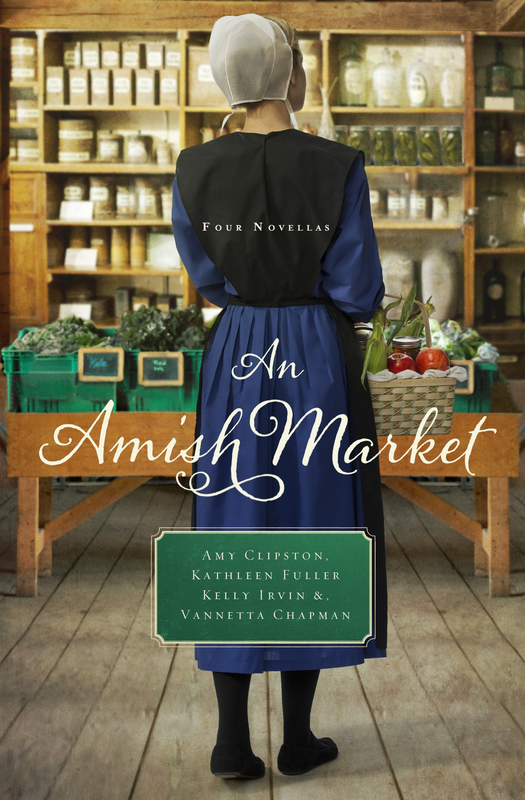 A Bid for Love by Kathleen Fuller Every week, Hannah Lynne brings her home-churned butter to the local market. And every week Ezra stops by to purchase some. Hannah Lynne knows not to read too much into it—Ezra is a confirmed bachelor and barely even glances her way, despite any hope to the contrary. But when Ezra bids an exorbitant amount to win the quilt she had her heart set on, Hannah Lynne can’t stop her heart from taking over her mind. Could Ezra finally be in the market for love? Sweeter Than Honey by Kelly Irvin Shattering a jar of pickled beets wasn’t the impression Isabella hoped to make on her first trip to the local Combination Store of Bee County, Texas. But as embarrassed as she was by the accident, she didn’t think it warranted the frosty reaction from the handsome manager of the store, Will Glick. As she soon learns, though, Will’s heart has been broken one too many times. And now, for some reason, Isabella finds herself determined to be the one to repair that broken heart and renew his faith in love. Love in Store by Vannetta Chapman Stella Schrock works at the Old Mill in Nappanee, Indiana, with new employee David Stoltzfus, a recent widower. When strange happenings begin occurring around town, it appears as if someone wants to close the mill. Stella and David have to work together to solve the mystery of what is happening at the Old Amish Mill, and in the process they might just find that God has more in store for their future than they would ever have dreamed possible. Love Birds features Ellie and Margaret Lapp, who are secondary characters from The Forgotten Recipe, which is the first in my Amish Heirloom series. I enjoyed having the opportunity to share Ellie's story with my readers. This book is dedicated to my sons, Zac and Matt.